This Web site is made to disseminate the information of industrial technology development in Japan, and invite Asian students and young generations to study about Japan industry. ts and forms were revised a little bit, and publicly open it to in August 2016. The contents are the annals of the industrial technology development and introduction of the industrial technology Museum in Japan, particularly focused on the visiting report (mainly in English, partly Japanese). The First Corner is the introduction of industrial museum activities in Japan and visit report by describing real scene of the visit. The national and local public institutions, and major manufacturing companies establish various type of industrial museum to show the historic records of the development and advanced technology materials as a social activity. These are precious assets vividly describing the previous outcome of industrial development and the goals of modern high-end technology which have cultivated in the Japanese industrial development process. This site tries to introduce these activities with pictures and writings. 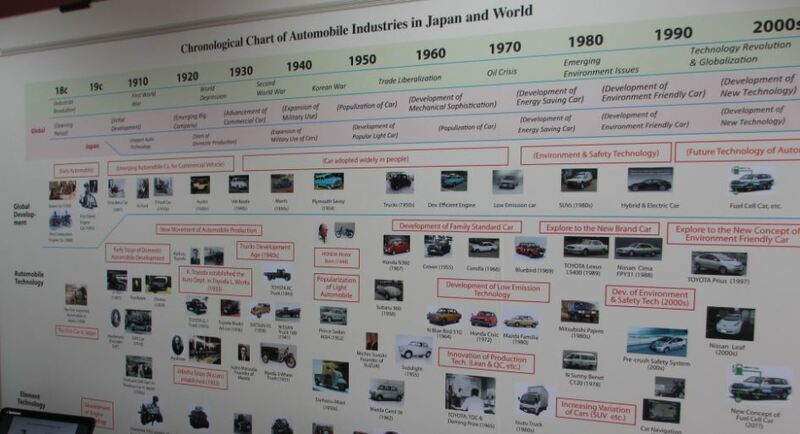 The first corner is a chronology form of the materials summarizing the outline of the technology development of Japanese major industries, automobile and electric industries. It is divided into three sections. The first section shows a brief chronology data in the graphic format on the Japanese technology development referring to the global movement. By looking at this data, the viewers might see the rough figure of development process of both industries. The second and third section of this corner is about the automotive and electrical/mechanical industries in detail with the form of slideshow in the historical perspective. Of course, it is almost impossible to cover all the industrial technology movement in this small corner, but the viewers will be able to figure out the major flow of development, current situation and challenges faced by them. Last but not least, we hope these modest trial Web Homepage data would give some help to enhance knowledge on Japanese industrial technology, and to stimulate Asian young generation to vigorously participate in the industrial development works in their own countries.